Where are women of color in politics? Are they in the decision-making engines? In local city or county councils? On the Hill? Most importantly, are women of color represented in positions where we have actual impact? And if not, why not? Tonia Bui, creator of Politics Within Politics, incites readers to confront these questions in approaching our own local and national politics. By recounting personal and anecdotal experiences that stem from her extensive career at the Capitol and her current work running a local campaign in Montgomery County, Maryland, as well as the stories of other local women of color, Tonia bravely defines what it means to be an Asian American woman within politics. I recently had the opportunity to speak with Tonia about the beginning of Politics Within Politics, the issues women of color experience in the political world, and Asian American feminism as a framework within politics. The following is a transcript of our conversation, edited for flow and clarity. Please share what it was like for you to become politicized as an Asian American woman. What was your upbringing like? What did you struggle with in terms of your work and your identity? TONIA: I grew up in a predominantly Latino and African American city in San Bernardino County, California. Its Asian American community was not as big as those in San Jose or Virginia for example, but growing up there shaped how I became politicized and led to the emergence of Politics Within Politics. I lived in both worlds, as an Asian and as an American, growing up with a Vietnamese immigrant background. My parents were political refugees of the Vietnam War, so there was tension of always wanting to speaking Vietnamese and also not being allowed to speak it. I remember when I was in elementary school, the administrators put me in an ESL program, but this became a disservice to me because I wasn’t falling behind in my English at all –I was already at the elementary level! So I think as I grew up, the Asian-ness dominated because it related to my gender identity: it dictated how I could dress, how loud I could be, how much I could smile, how much I could do in my life. That was when I started to see and question things like: why could my brother do all of these things but I couldn’t? Why did I need to be quiet when I’m clearly not? My political “aha” moment arrived when I chose to go to University of California-Berkeley, a very political campus. That opened my eyes to activism. I ended up doing my undergraduate in Mass Communications and Gender Studies. When I decided to study Gender Studies, I dealt with questions related to what it meant to be a woman and what it meant to be an Asian, as well as how my identity interacted with other social norms. I was able to look at my mom’s upbringing, and ask questions like: Why is my mom so ostracized for going to get a higher education? Why is more pressure placed on women to become mothers instead of job seekers?? I started to look at things in a very different lens. You mentioned growing up in a very diverse community. What differences and similarities did you realize across different communities of color? TONIA: My best friend is Mexican American and her mother was undocumented. Just recognizing that we grew up in the same circumstances and the same community — both of us being apart of the working class, struggling with a second language, joking that rice is universal — allowed us to realize there was such a comfort zone. There were things we would learn to appreciate about each other. Working for the former Vice Chair of the House Democratic Caucus, Xavier Becerra — who is now the Attorney General — we focused on a lot of issues related to the Latinx community. There was a lot of overlap including economic disparities and educational disparities among certain Asian Americans sub-groups, for example. Being the only Asian American in the room at think tank forums, I questioned why the data made available only represented African Americans and Latinx community. Where were the Asian Americans? Aren’t we a minority, too? So in general, if I wanted to get something done, I had to build alliances. In terms of differences, I noticed that the Latinx community shared one language whereas Asian Americans didn’t; so we [Asian Americans] struggled in building alliances with each other. I became that person to represent the Asian American constituencies and to really navigate every single Asian ethnic group that could be there. This goes hand in hand with why I created Politics within Politics. I wanted to define our Asian American identity, because in our politics, we could never be seen as part of the mainstream. As the Asian American liaison in the room, I was worried I would pigeonhole myself and so I couldn’t be a champion of income equality, healthcare, and all of these other issues I cared about. But because of what I looked like, within the political structure, I watched how Asian American leaders like former Congressman Mike Honda were less respected when they stood up to speak on issues related to Asian American communities. 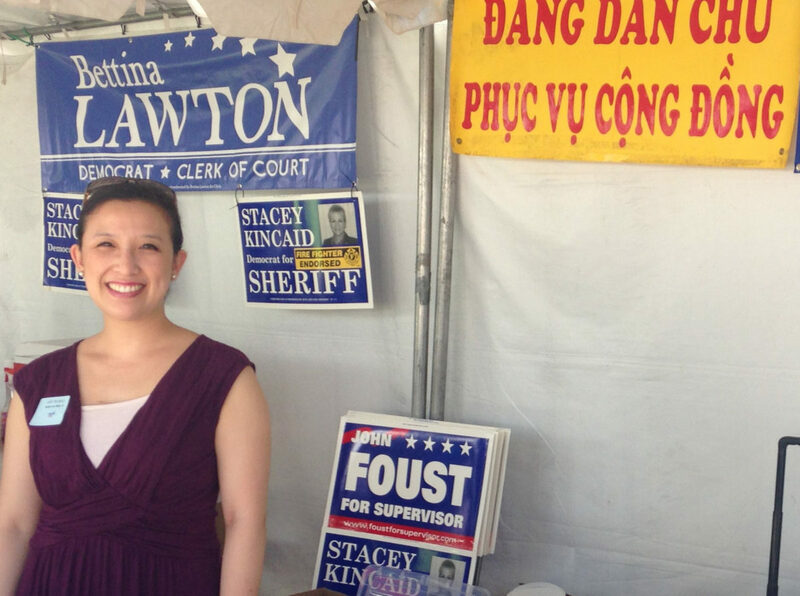 I was going to be campaign manager for my friend, Hung Nguyen. But instead, we decided to hire a white male campaign manager. It was part of campaign strategy, because we knew at the end of the day, my Asian American friend Hung Nguyen was only seen as just that. After we lost, the Washington Post ran this article, entitled Foreign-born Democrats” loses to Republicans in Virginia But Are Optimistic About the Future” and this set my fire to write Politics within Politics. I thought to myself, “Why can’t you just write ‘US-Born citizen’ to make it fair?” I was tired of constantly fighting to mainstream minority people in politics as though we don’t belong. I wrote this commentary that got published in Harvard Asian American Policy Review in 2014 about shaping the mainstream as an Asian American woman and from there I took it and turned it into my blog. I wanted to dispel negative Asian American stereotypes — that we have skill sets, are capable of functioning in the political engine, and we can do things well. This is the invisible stuff that is not seen, and I want to call it out. Why and how did you develop Politics within Politics? What is the purpose of Politics within Politics and how does it fulfill its purpose? TONIA: I want to find solutions and get us to where we are the mainstream. I want others to stop seeing us as hyphenated; instead, we should be seen as fully American. I also want women of color to have a face, to let them know that they’re not alone, and that there are ways and techniques as to how to run for office. I want to make politics accessible to women of color. My blog also tries to address gaps in politics as well. A problem we have is that current data show Asian Americans don’t vote, so major political parties don’t court the Asian vote. It’s now 2018, and we still have this problem and we’re still trying to get candidates to do ethnic outreach. I also don’t want people to pigeonhole the blog as a space just for gender or race. It’s taken places that I never thought it would be, and I say this because I think there’s a grey area. I didn’t expect this but political scholars have picked up my work. I don’t think I fall under the field of political science either or Asian American studies. I want to encourage [readers] to create a dialogue with me if they disagree. What are issues concerning women, and women in color you’ve noticed and learned about since Politics within Politics? How do you work to counter them or address them with Politics within Politics? TONIA: Women of color are not seen as being in positions of leadership. Working in a political space, people maybe don’t see you as a campaign manager per se. During the campaign season, the women of color in our county came together and they put together a forum. It was almost twenty candidates in this room, all lined up , giving their pitch for why they were running. They talked about how much more challenging it was to be a woman of color running because they don’t get the press coverage or the same attention. It was so hard to be a candidate because there were certain issues they wanted to fight for, but they had to be more of a broader candidate instead of one focused on one issue. We talked before about a lot of my generation advocating for taking down systems or deconstructing things, did you ever feel this way? TONIA: In order to change system, you need to be a part of the system. I think there’s a lot to be done, but it needs to be done in steps. If I wanted to make change, I need to keep increasing the diversity factor out here and do the work that we do. The system is there, it just needs to be restructured, and we need the right people. I’m only one person, but if only more of us were able to use those tools to make change. Because we’re not at the table, we need more women of color in this space. With regard to Asian Americanness, I was curious as to how you retain your Vietnamese culture, your identity, and how you would recommend to young people in retaining your identity as a Vietnamese person as much as a Vietnamese American. TONIA: I preserve it because I think it embodies what American society is. It is a place where we can celebrate our culture and heritage without anybody stopping us. In politics, I use this cultural identity as a means to engage. Because I’ve been able to speak the language, I’ve been able to get into doors. When I navigate with my native tongue, I get a little more respect and can even turn out the vote. Mind you I don’t write or read, but I do my best to speak when I can at home and with my husband. How do you define Asian American feminism for yourself? My definition of feminism is really shaped by being a political candidate’s wife because that was the first time I really felt my feminism was being challenged. A lot of feminists and strong women of color said, “You would rather have your husband run instead of you?” I just think that I’m still a feminist even if I’m somebody’s wife, and nobody can define that for me. The campaign was really “We’re running” versus just Hoan running. I’ve seen campaigns that have led candidates to divorce, so I know the work is hard. I think politics has really changed the way I view feminism. I had to stand by my husband; is that feminist itself or am I not being feminist enough? Should I abandon my husband and go run for office and run against him? But I thought that wouldn’t be right. if I ran for office,I wouldn’t be 100% in whereas my husband was 110% in. Feminism for me means many things; it’s not just one. I noticed that you very much sound like when you believe in something, you very much believe in it, and that’s something I know I wish to tune into for myself as an Asian American woman. I also imagine that it’s so easy to experience imposter syndrome especially in politics and especially how you grew up. I was curious as to how you became so confident in what you believe in or what grounds you in what you believe in? TONIA: I’ve approached everything in my life as an opportunity to make change. Yes, my husband and my girlfriends hear me complain, “Today I went to a meeting and I was the only person of color and here I am speaking.” But while I don’t necessarily feel like I don’t belong there, a lot of times, I doubt what I have to say is valuable. So sometimes I’m in a space of older white people, and there’s me, who is 2-3 decades after them and I have ideas to share. So I think it’s not so much about whether or not I belong there but about questioning whether or not I have credibility as a woman of color and being younger. I think that’s something that I’ve always had to deal with. I feel that I do belong. I feel that is tied into what being American is, to be granted the opportunities to be in such spaces. And I’m not going to ignore that I am very privileged and my husband is privileged; we are very privileged in the sense that we have access to such opportunities to influence change. We’re in such a place that we can do that, and we’re probably the .0001% of the Asian American community that can do that. So I don’t really have an answer as to how I found my confidence, I just always have listened to my gut. When I mentor women of color and they tell me about how difficult it is in intimidating spaces, my only advice is to speak to that. If you want to go after something, do it in a way that’s most comfortable to you. I believe in the power of the media or social media; our President proves that. We don’t have to go out and protest anymore. There are other ways to spark dialogue. This is what I stand for, and I’m not going to back down.